"That one was for Chad." 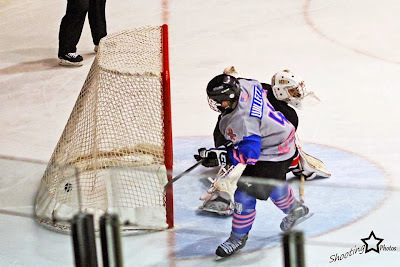 Dominick Sacco and Daniel Willett each scored in the overtime shootout to propel the Lincoln Stars to a 4-3 OT SO win over the Youngstown Phantoms Friday night at the IceBox. With the big win and the two points, the Stars improved to 4-9-4 (12 points) and are in sixth place in the USHL western conference. For the first time in a while, there are teams (Fargo and Tri-City) below the Stars in the standings. Lincoln is now only one point out of fifth place in the west. Click here to view the current USHL standings. Before the game began, the Stars held a very moving tribute for former head coach Chad Johnson. Public address announcer Craig Estudillo read a statement from the Stars that left no dry eyes in the rink. Afterwards, there was a moment of silence. After the moment of silence, every member of the Stars, who were standing together at the blueline, did a stick tap to the sky for Chad. It was incredible. Click here to view the helmet decals the Stars will wear this season in honor of Chad Johnson. Click here to view the helmet decals all USHL officials will wear this season in tribute to Chad Johnson. Once the game began, I thought both teams looked a little sluggish in the first period, especially the Stars. With what they've had to deal with this week, I can understand why their heads may have not been in the game to start. Neither team would score in the first period, with Youngstown leading in shots through the first 20 minutes, 10-7. In the middle period, the Stars (specifically Brandon Smith) exploded for two quick goals only 24 seconds apart to take a 2-0 lead. Smith's goal at the 8:09 mark of the second came on a powerplay, with assists going to Luke Voltin and David Parrottino. Smith's goal at the 8:33 mark was at even-strength, with assists going to Luke Voltin and Daniel Willett. Both of these goals were scored on the other side of the IceBox from where I sit, so I didn't get a very good view, but it looked like good work down low by Smith on each tally. With the 2-0 lead halfway through this game, the Stars were flying high and the crowd was going nuts. However, the Stars just were not able to stay out of the penalty box for most of this game, which opened the door for the Phantoms to get right back in it. In my opinion, if it wasn't for the undisciplined penalties, the Stars keep that two goal lead and cruise to a regulation win. Luckily for the Stars, the Phantoms played just as undisciplined at times also. With only 1:21 remaining in the second period, the Phantoms scored a powerplay goal to pull to within one goal. Stars took the 2-1 lead into the second intermission with Youngstown leading in shots on goal, 25-18. In the third, the Phantoms struck first with an even-strength goal at the 5:10 mark to even the score at 2-2. Lincoln's two-goal lead had vanished, and suddenly it wasn't looking so hot for the Stars. Dominick Sacco put the Stars up 3-2 with a nice goal-mouth scramble effort while on a powerplay at the 12:30 mark of the period. Zach Frye and Christian Lampasso had the assists on Sacco's PP goal. It was looking like the good guys were going to hold onto that lead and win in regulation, but bad penalties let the Phantoms back in the game again. At the 15:07 mark, the Phantoms scored their second powerplay goal of the game to knot the contest up at 3-3. Shots were 38-26 in favor of Youngstown through sixty minutes. Both teams put five shots on goal a piece in the five-minute overtime period, but neither squad would score. This one went to a shootout. In the shootout, Stars goaltender stopped three of four Youngstown shooters, while Sacco and Willett each scored for the Stars to give Lincoln's its second straight victory. Willett's goal was the eventual game-winner. Both Sacco and Willett appeared to use the same backhand to forehand deke on Youngstown goaltender Colin DeAugustine to get their goals. Lincoln went 2-for-10 on the powerplay while the Phantoms went 2-for-9. Youngstown netminder Colin DeAugustine stopped 28 of 31 in the loss. Michael Bitzer was the #2 star of the game has he stopped 40 of 43 shots to record his second straight win. Brandon Smith was named the #1 star of the game for his two goals. Smith also finished the game +1, with four shots on goal and one fight. Even with all the penalties, last night's game was a lot of fun to watch. So very happy the Stars were able to pull this one out for Chad. I'd like to think his spirit was there inside the IceBox last night rooting the team on to victory. The Stars will be back at the IceBox tonight to take on the Waterloo Blackhawks, who lost last night to Team USA U-18 by a score of 8-6. Considering that they had 8 goals put on them at home, I'm sure the Blackhawks will be a salty bunch tonight and will want to rebound with a better effort against the Stars. Meanwhile, Lincoln will be looking to win their third game in a row. Should be a good one. At tomorrow night's @LincolnStars game we will be doing an Applebee's apple toss to benefit Chad's son Jack. Please buy an apple & donate.